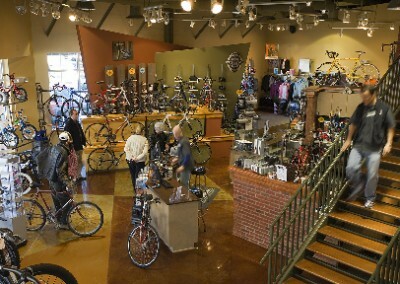 Cool Breeze Cyclery is a premier bicycle shop in the Lake Norman region. Its successfully integrated design details and materials are reminiscent of the owners’ former quaint Mooresville Main Street shop, with contrasting modern accents of cantilevered walls, stained concrete floors, and an exposed ceiling structure. 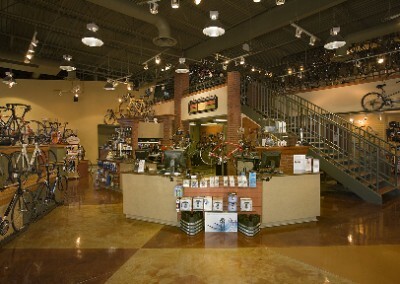 The service area is also surrounded by brick walls reflecting the nostalgia of the previous shop location. 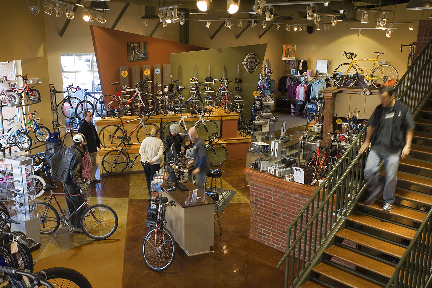 The space caters to every type of cyclist and is family-oriented with a reception area that includes a children’s play space. 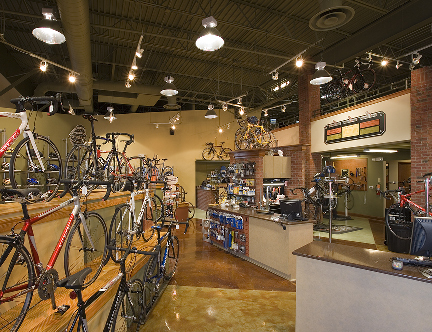 The store is divided into retail zones encompassing specialty manufacture displays designed for the specific needs of the cyclist. Careful attention went into the design of the cantilevered walls to be used as displays for helmets and shoes. 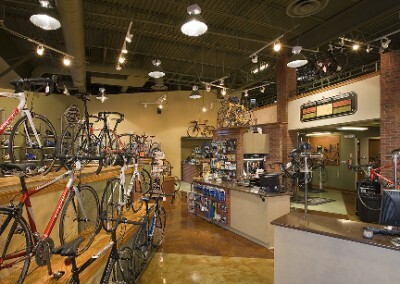 Cool Breeze Cyclery also incorporated a climate-controlled Performance Center that includes a fitness area with treadmills and other equipment as well as interactive stationary bikes called Computrainers with projection screens where cyclists can compete in a virtual environment. This space was designed for personal trainers to assess client needs and help out with fitness questions. Not only was the Performance Center given much attention to create a personal atmosphere, but part of the mezzanine was designed as a fitting station where personal attention is once again given by the owners to assist with the cyclist’s needs. Each detail was given careful attention to provide a unique and personal shopping experience.